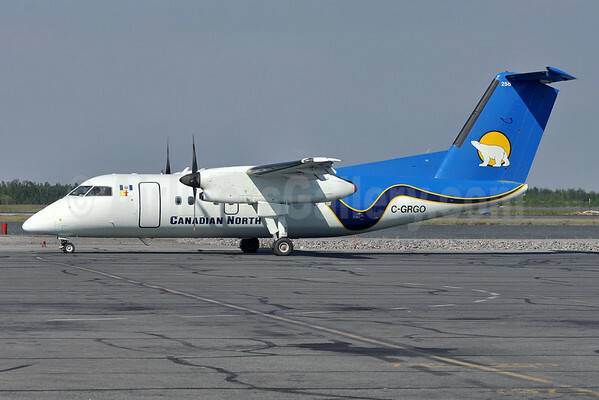 Canadian North Inc. (Yellowknife) and First Air (Ottawa) announced in May they had reached an agreement to codeshare on selected flights operated by both airlines in the far north region of Canada. The two carriers had previously planned to merge but later called off the merger. The codeshare agreement was their alternative to a planned merger. 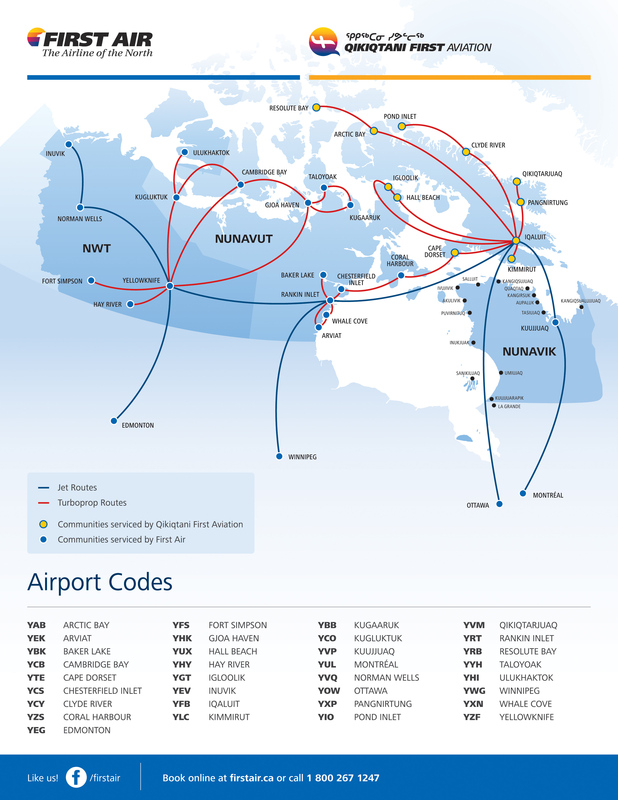 The codeshare agreement will start on July 27 with significant changes for both carriers. Above: Canadian North: “Our northern point of view” (click for full size view). implemented, replacing the existing Dash-8 turboprop flights. A Monday morning flight will be introduced from Yellowknife to Edmonton. Combined service will continue with three days per week service. Top Copyright Photo: Ton Jochems/AirlinersGallery.com. Canadian North’s Bombardier (de Havilland Canada) DHC-8-106 Dash 8 C-GRGI (msn 304) taxies at the yellowknife base. Bottom Copyright Photo: Ton Jochems/AirlinersGallery.com. 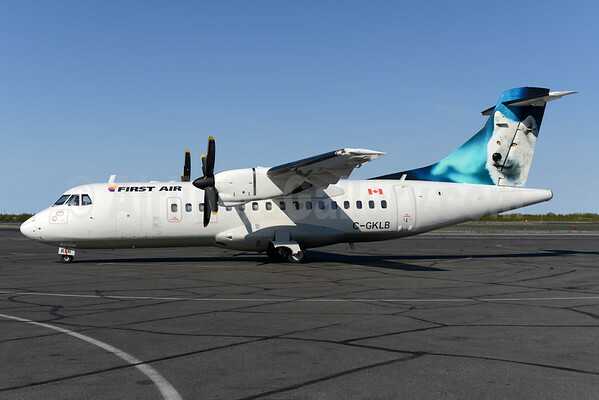 First Air’s ATR 42-300 C-GKLB (msn 331) with the wolf on the tail is also seen at Yellowknife, a common connecting point for both carriers. 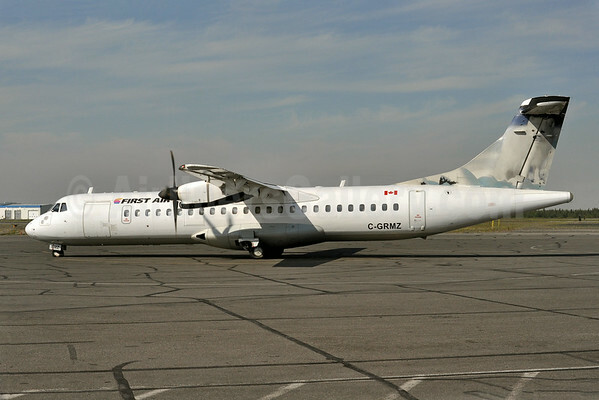 This entry was posted in Canadian North, First Air and tagged 304, 331, ATR, ATR 42, ATR 42-300, Bombardier, Bombardier DHC-8, Bombardier DHC-8-100, C-GKLB, C-GRGI, Canadian North, codeshare agreement, Dash 8, DHC-8, DHC-8-100, DHC-8-106, First Air, yellowknife, YZF on July 8, 2015 by Bruce Drum. 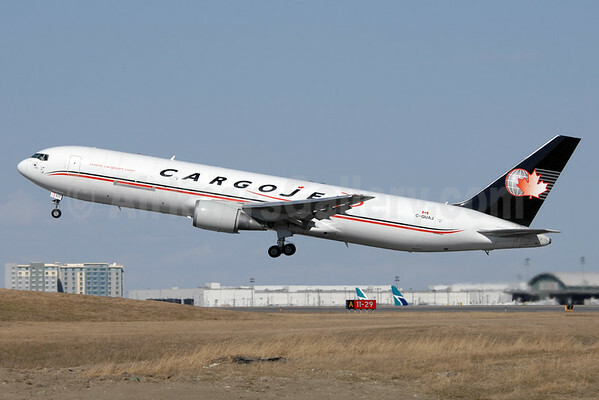 Cargojet Inc. (Cargojet Airways) (Hamilton), Canada’s domestic premium overnight air cargo network operator, and First Air (Ottawa), the Airline of the North, announced today that they have expanded their commercial co-operation agreement effective July 1, 2015 and extended their Transportation Agreement to June 30, 2025. 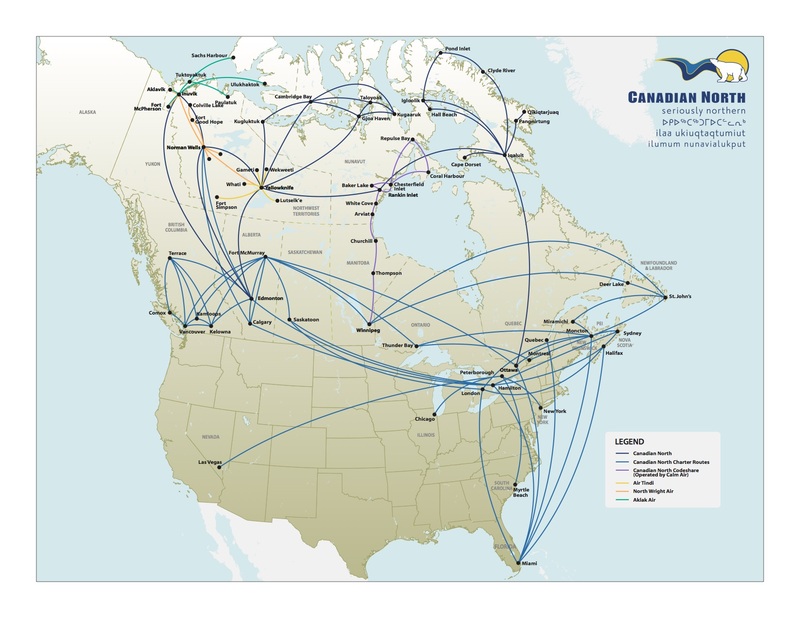 This agreement further strengthens the strategic alliance between the two companies, and will allow for seamless air cargo transportation between the 14 major Canadian cities served on Cargojet’s overnight air cargo network as well as the 32 communities served by First Air in Canada’s North. Above Copyright Photo: Chris Sands/AirlinersGallery.com. Cargojet Airways Boeing 767-35E ER (F) C-GUAJ (msn 26063) departs from Calgary. Below Copyright Photo: Tony Storck/AirlinersGallery.com. 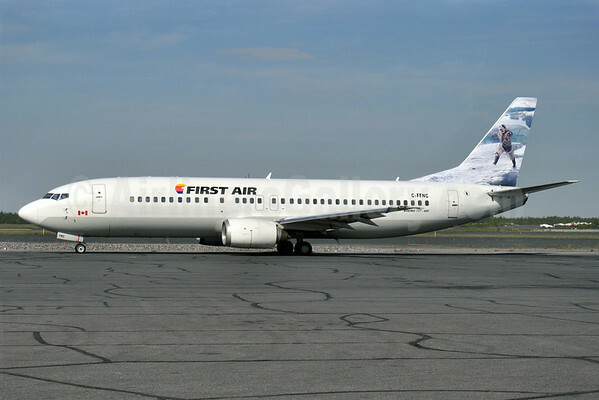 First Air Boeing 737-406 C-FFNC (msn 27232) (Native Hunter) taxies at Yellowknife. This entry was posted in Cargojet Airways, First Air and tagged 26063, 27232, 737, 737-400, 737-406, 767, 767-300, 767-35E, Boeing, Boeing 737, Boeing 737-400, Boeing 767, Boeing 767-300, C-FFNC, C-GUAJ, Calgary, Cargojet Airways, Cargojet Inc., First Air, yellowknife, YYC, YZF on June 30, 2015 by Bruce Drum. WestJet (Calgary) today (May 3) launched new, nonstop daily service between Calgary and Terrace, British Columbia, and between Calgary and Yellowknife, NT. Flights between Calgary and Terrace will be operated by WestJet Encore’s fleet of Canadian-made Bombardier Q400 NextGen aircraft, while flights between Calgary and Yellowknife will be operated by WestJet’s fleet of Boeing Next-Generation 737s. 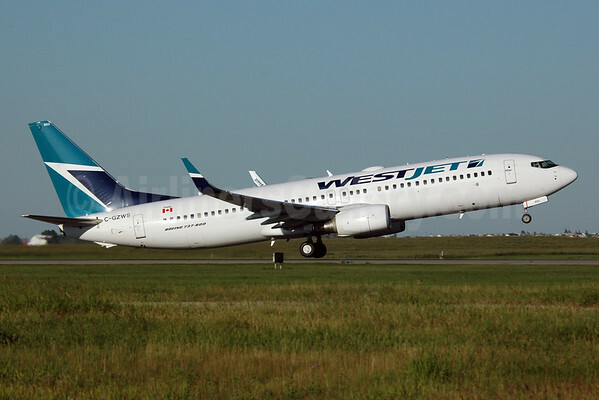 WestJet today also launched new, daily nonstop service between Toronto (Pearson) and Gander, Newfoundland, on board WestJet’s Boeing Next-Generation 737 aircraft. Copyright Photo: Chris Sands/AirlinersGallery.com. Boeing 737-8CT C-GZWS (msn 32770) is pictured in action at Calgary. This entry was posted in WestJet, WestJet Encore and tagged 32770, 737, 737-800, 737-8CT, Boeing, Boeing 737, Boeing 737-800, C-GZWS, Calgary, Terrace, WestJet, WestJet Encore, yellowknife, YYC on May 3, 2015 by Bruce Drum. 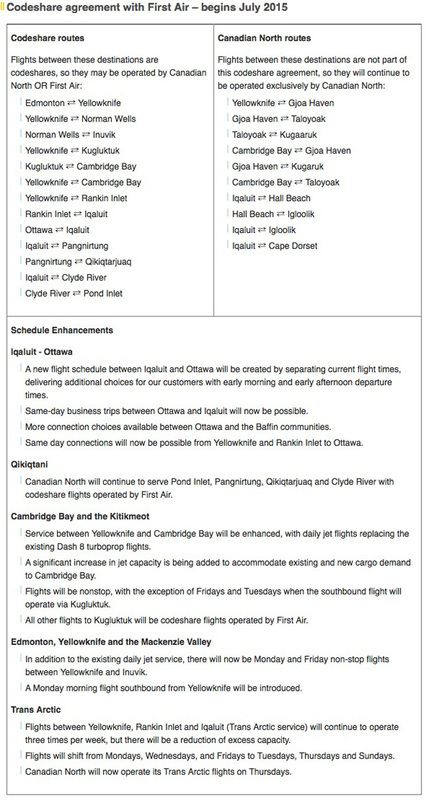 Summit Air (Yellowknife) will begin operating its 90-seat Avro (BAe) RJ85s on two routes for First Air (Ottawa). 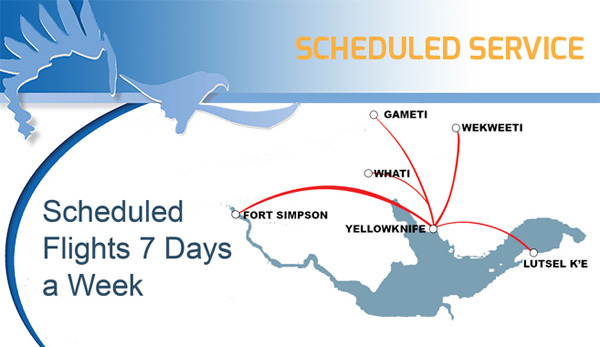 On January 27 the company will begin operating on the Yellowknife – Edmonton route and on February 2 it will begin operating on the Yellowknife – Norman Wells – Inuvik route. On January 20 Summit Air announced the purchase of a second Avro RJ85 jet to meet market demand for remote destination crew movements and ACMI (aircraft, crew maintenance and insurance) contracts. Summit Air is part of the Ledcor Group of Companies and operates a fleet of helicopters and fixed wing aircraft throughout Alberta, British Columbia, Northwest and Yukon Territories. 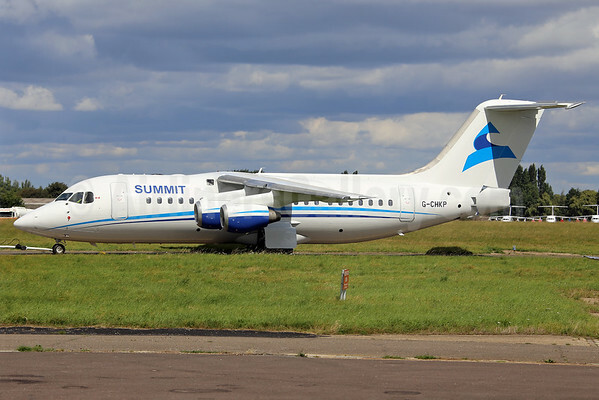 Summit Air’s second AVRO RJ85 is scheduled to be delivered in late April 2015. Summit’s AVRO RJ85 is a UK-built aircraft equipped with auto throttle, EFIS flight deck, WAAS/LPV capable and is the only next generation jet certified in Canada for operations onto gravel runways. With a long-range cruising speed of 720 km/hr (450 mph), and a maximum operating speed of 763 km/hr (475 mph), the Avro has a 43,000 kg (97,000 lbs.) maximum takeoff weight. The aircraft is powered by four Honeywell LF507-1F high bypass FADEC engines capable of 7000 lbs of thrust each. The engines feature low noise levels and low emissions, making it one of the quietest and greenest aircraft in its class. Copyright Photo: Keith Burton/AirlinersGallery.com. The first Summit Air BAe (Avro) RJ85 is pictured as G-CHKP (msn E2302) at Southend which became C-FLRJ on delivery. This entry was posted in First Air, Summit Air Charters and tagged Avro, avro rj85, BAe, BAe RJ85, C-FLRJ, E2302, Edmonton, First Air, G-CHKP, Inuvik, Norman Wells, RJ85, SEN, Southend, Summit Air, Summit Air Charters, yellowknife on January 24, 2015 by Bruce Drum. 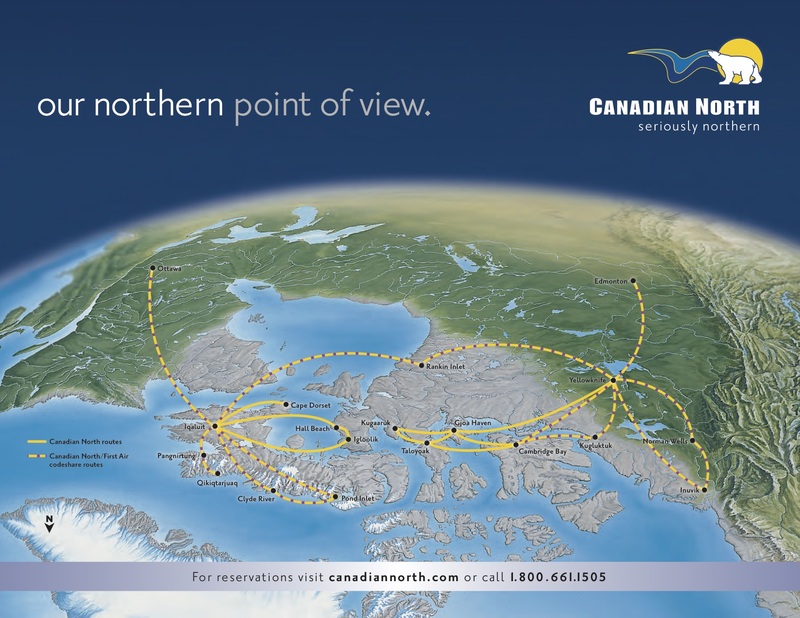 First Air (Ottawa and Yellowknife) flies to some of the most remote parts of the world in the northern Arctic regions of Canada (see route map). 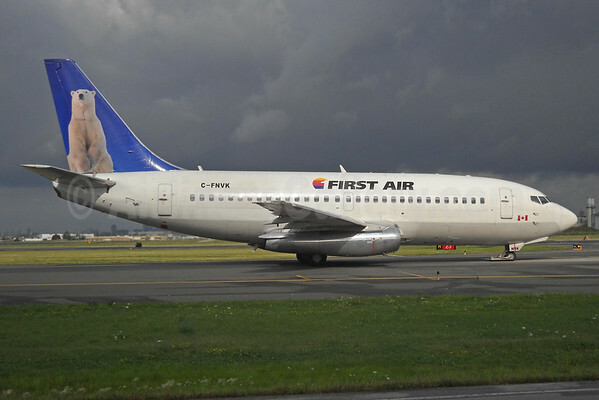 First Air uses an unique tracking system designed by FLYHT Aerospace Solutions. According to the company, the system automatically transmits four-dimensional GPS-based based position and flight data recorder information according to this article by the Daily Mail. Copyright Photo: Tony Storck/AirlinersGallery.com. ATR 72-212 C-GRMZ (msn 432) with the image of an Arctic Fox on the tail prepares to taxi from the gate at Yellowknife. This entry was posted in First Air and tagged 432, Arctic, ATR, ATR 72, ATR 72-212, C-GRMZ, First Air, FLYHT Aerospace Solutions, navigation, northern Arctic regions, route map, yellowknife, YZF on January 3, 2015 by Bruce Drum. 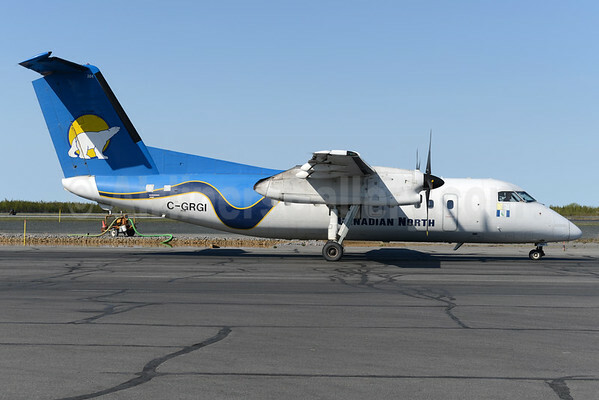 Air Tindi (Yellowknife) flight from Yellowknife to Fort Simpson yesterday (November 20) was forced to turn back after departure. However the airliner was forced to make a safe landing on the ice of frozen Great Slave Lake due to poor weather at the airport. The six people on board were later airlifted to the airport. The Cessna is still on the lake. The aircraft took off from Yellowknife with reported freezing drizzle. 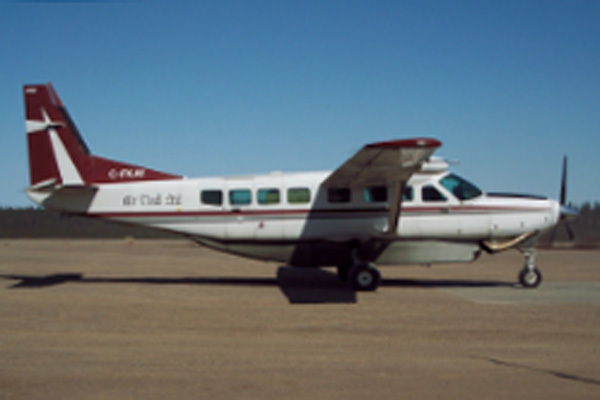 This entry was posted in Air Tindi and tagged Air Tindi, Cessna, Cessna 208, Great Slave Lake, yellowknife on November 21, 2014 by Bruce Drum.